Powder researchers at Jay Peak Resort say they have developed new artificial snow-making technology that will revolutionize the winter sports industry and help resorts generate revenue during off-season months. 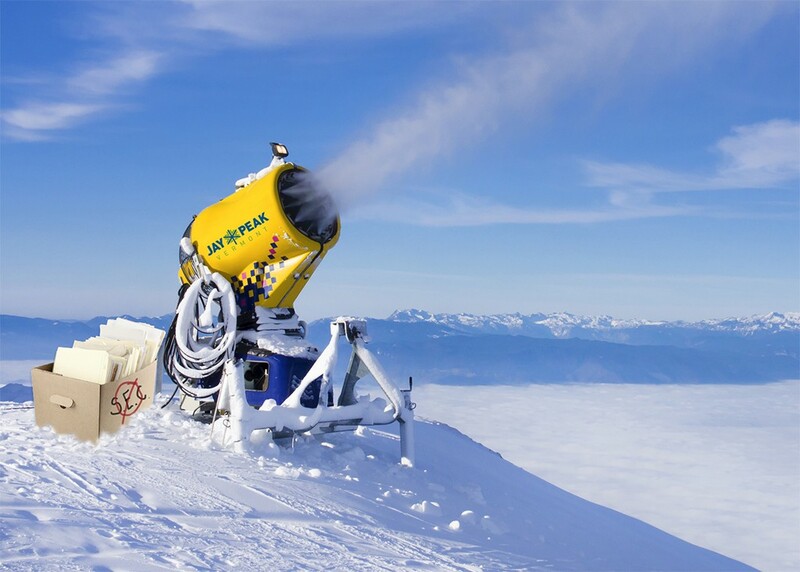 Their patented “cash-flow snowblower” cannon can produce manmade snow in temperatures of up to 47 degrees Fahrenheit, potentially extending the ski season by several months. The snow's higher melting point is made possible due to the addition of an unconventional yet abundant ingredient: shredded financial documents. Pengles said that, unlike other paperwork, shredded financial documents tend to be “fluffier,” padded by make-believe figures and projections that vanish into thin air. Those hollow figures are easily converted into a weightless powder comparable to the fresh snowfalls that inspire devoted skiers and snowboarders to wake up early and make the first chairlift. “Chances are, if the document was fluffy enough to get shredded in the first place, it’s fluffy enough to get shredded by thrill seekers charging down a mountain,” Pengles added. The resort has been quietly testing its new snow-making apparatus since September, and so far the response has been overwhelmingly positive. A spokesperson for Jay Peak said the technology has the potential to simultaneously resolve two major concerns looming over the resort. The first, of course, is the threat of a shortened or nonexistent riding season due to the effects of global warming. The second is , well, alleged fraud. Toolstand explained that the Securities and Exchange Commission seized more than 300,000 financial documents during its investigation of the “Ponzi-like” scheme. When asked if she was advocating for the destruction of evidence in cases of alleged fraud, Toolstand replied that she was simply doing her part to prevent fraud in the first place. Jay Peak’s new "snow" cannons are scheduled to go into full operation next spring.